New Jersey Arts Annual . . . The Morris Museum . . . Morristown, NJ. . . December 26 - April 6 , 2003 , Opening , January 26, 2003 from 1 - 4 pm . . .
Peace Show . . . Kentler International Drawing Space . . . Brooklyn, NY . . . December 6 - 29 , 2002 . . . Opening: Friday , December 6, 6 - 9 pm . . . I am in constant search for new modes of artistic expression, both in style and media. Currently, I am working with clay in a new series of sculptures. My interest in ceramics developed in 1992 when I witnessed a group of ceramicists working with clay in a studio outside of Trinidad, Cuba. I was not only amazed by the gigantic size of the pots, which were thrown on kick wheels, but also by their mysterious hollowness. My intention in the work represented here is to capture the essence of religions that deal with the worship of idols. Each sculpture takes the form of a cone, a religious icon often found in West African cultures, and later imported to the Americas. These forms present a rounded surface where I engrave lines and signs, a common element in my two-dimensional work. I also incorporate small openings on the surface that, like windows, let the confined inner space communicate with the outside world. I utilize this imagery to challenge the viewer’s perception of space and three-dimensionality. 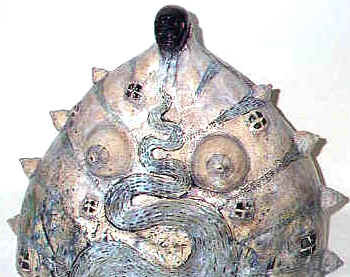 All the work is made of earthenware clay, which has a high iron content. I use a unique slab hand building technique. The surface is low fire under-glazed and glazed. I incorporate inlaid slip, and scrafitto, slip scratched through to the clay surface. The pieces are fired in an electric kiln to about cone 04, 1800 degrees Fahrenheit. All the material and photographs presented herein are the sole property of Diosmel Gonzalez. No reproductions or copies may be made without the express written consent of the artist.